If you've ever missed a connecting flight and had to stay overnight because the next plane out leaves the next morning, you'll understand the crappy, sinking feeling I had when it happened to me. It's even worse when that plane flight is the one home. Anyway, when I landed at Hong Kong at 2am, 9 hours after I was supposed to have arrived, and 4 hours after my connecting flight had left, and facing my third day (yes third!!!) in transit, I could either give up, curl up on the cold hard airport floor and make feral noises, or make my way to the hotel room procured by the airline, curl up on the hard lice-ridden bed and make feral noises so I wouldn't be distracted by the sound of the trains periodically passing by every half an hour. Lucky for me, the airline put me up at a decent hotel, the Sky City Marriott, just minutes from the airport: no lice, soundless rooms, firm comfy beds and great service. and I didn't have to get to the airport until 12 noon the next day, so I could finally get a decent sleep. But in my walking-dead state, I forgot to demand that they chuck in breakfast as well. But that was to be the silver lining. 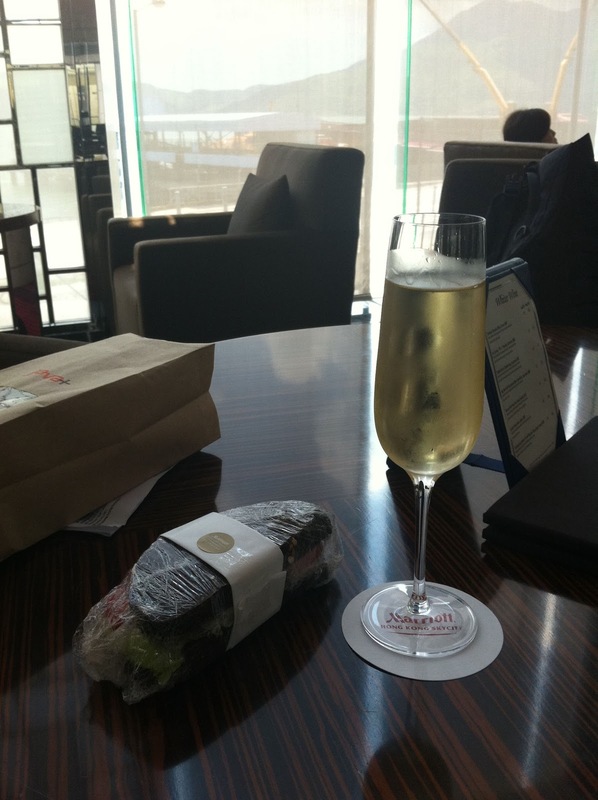 The next morning, at the urging of one of my long lost facebook friends (now living large in London), I ordered myself a glass of Moet et Chandon to go with my simple sandwich breakfast. Moet has really lifted its game in the last several years. There was a time when I just wouldn't choose to drink Moet. But this was a tasty beverage indeed. Feeling better already. I thoroughly recommend the champagne breakfast to everyone. While airside at the airport, I had a light lunch at the gigantic food court on the upper level. This place is amazing - it offers a massive range of cuisines and styles - everything from traditional Hong Kong barbecue dishes, to Japanese, to Italian, and even a sports bar. Anyway, I got myself a Hong Kong-style Hainanese Chicken Rice. Delicious, if not quite as spicy as the Singaporean style that I love (it's funny how Hainanese Chicken Rice is done so much better everywhere else in the world outside Hainan Island!!). 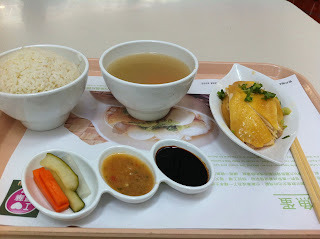 Accompanied by chicken rice, chicken broth, pickled vegies and two dipping sauces. The first dip was a standard sweet, thick soya sauce. The dipping chilli sauce was a slightly spiced up blend of ginger, garlic and some other secret ingredient, and the rice was sublime - light and fluffy, displaying the aromatic fragrance of having been cooked in chicken stock and garlic. All for the bargain price of HKD65. Feeling even better now. Make travelling wonderful again. Indeed! a 10g tin of Malossol caviar from Russia. The name suggests that it's got plenty of salt in it, but all I could detect was just a hint of saltiness, complementing the smooth, delicate, caviar-y flavour of the beautifully softly textured pearls. two chunks of Russian Balik Salmon. I like my salmon and have eaten lots of salmon in my time, but this stuff was sublime. Soft, yielding, flavoursome, with a distinct absence of fishiness in the smell or taste! I've never had salmon this good outside of a really good sushi place. a serving of foie gras - ecstasy. 'nuff said! with little toasted triangles of bread, chopped egg whites, chopped onion, creme fraiche and lemon conveniently wrapped in muslin to accompany. And a glass of Perrier Jouet to wash it all down. The Perrier Jouet was fresh, with soft, citrusy flavours; an excellent accompaniment to my session of therapeutic alimentation. The placemat says it all! Feeling perfectly blissful. And just in time for a leisurely walk to the boarding gate for my plane home. Next time you need to spend time in Hong Kong airport, don't just fritter it all on window shopping. Treat yourself to some culinary delights! Thanks a lot for your review. 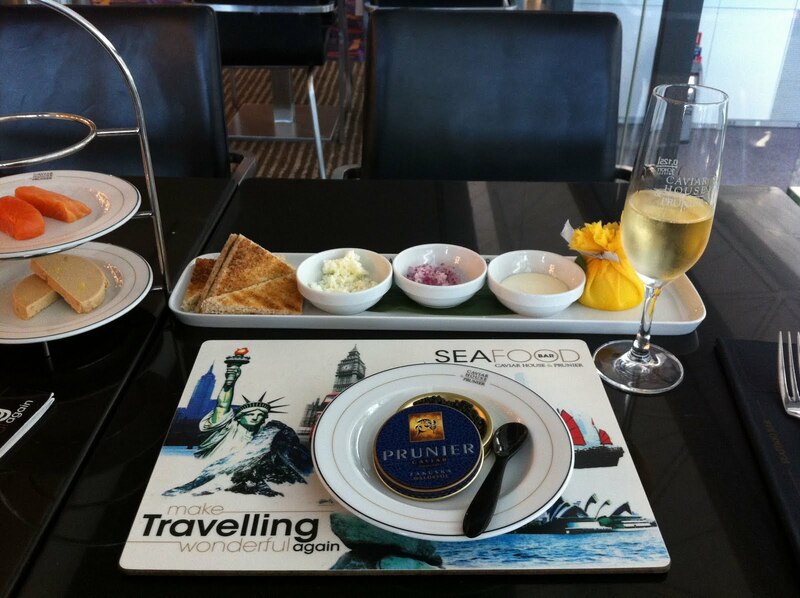 We're pleased that you enjoyed staying at our Seafood Bar in Hong Kong. Do you mind if we publish the link to this article on our Facebook page (https://www.facebook.com/CaviarHousePrunier)? Hi Caviar House & Prunier, please feel free to publish it! But I would appreciate if you could include a link to The Frenchman's Food & Wine Blog.